Major Milestone: Paul and I were talking about when we last tried cow’s milk with Joseph and decided it was time to try again. We started out with just a little milk in his cup, with mostly soy milk. We did this for a day and didn’t see any adverse effects, so the next day we 50/50ed it for a day. 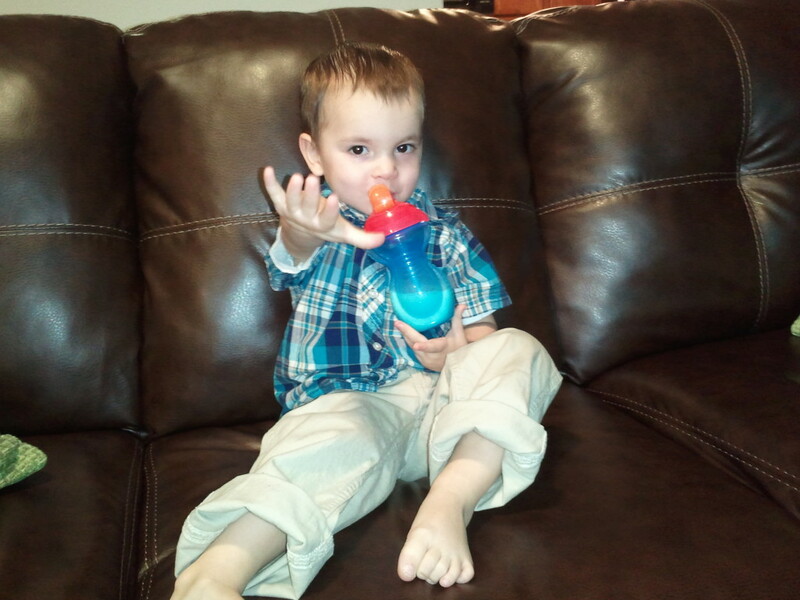 When that was a success, we decided to just give him all milk…and he doesn’t seem to have any problems! We’re still going to go easy on it for a while, but it looks like he might have grown out of his lactose intolerance! Yay! A Bunch of Sickies: With Joseph getting over strep, I was praying that the rest of us would stay well. Well, at least we didn’t get strep. I guess Joseph had the flu on top of strep (there was one day that he threw up, but I thought it was because of his antibiotic, since one of the side-effects is nausea). Paul and I both ended up with two slightly different variations. I had a fever and was throwing up (along with aches and chills) and Paul was nauseated with chills and aches (no fever and no throwing up…which is good, because he was at work). Joseph seemed to sense that I wasn’t feeling well and he went easy on me that day (luckily it only lasted 24 hours). After getting him up and feeding him, I told him I needed to take a nap, so he needed to play in his room. He said, “Okay.” So I gated him into his room, turned on PBS, made sure the baby monitor was on, and rested until lunch time. He happily played in his room for almost 2 hours! I fed him lunch and put him in for a nap, thinking I’d catch another nap while he slept. He slept for four hours! After we woke up, I was feeling quite a bit better, so I got dinner ready. I was able to sleep all night and felt completely well in the morning (as did Paul). Whew! 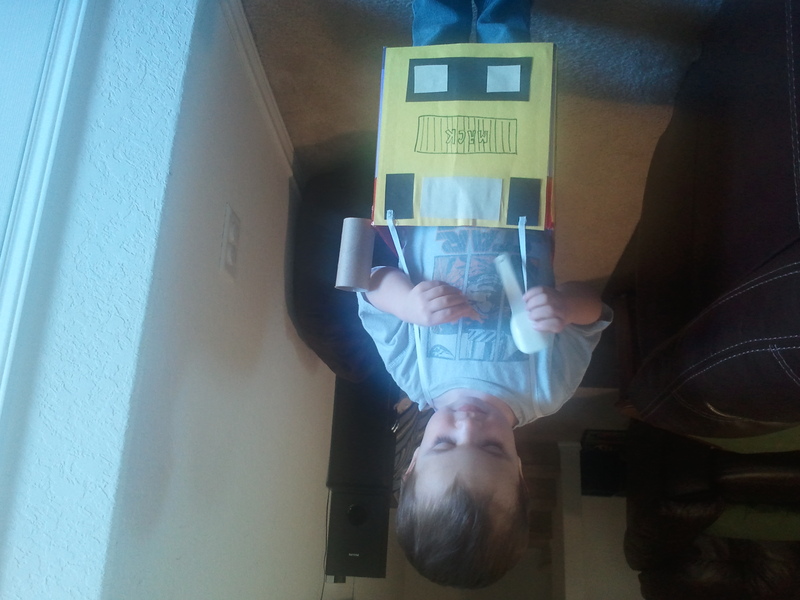 Cuteness for the Week: 1) Joseph was watching a show and saw that the kids were wearing boxes decorated like cars. 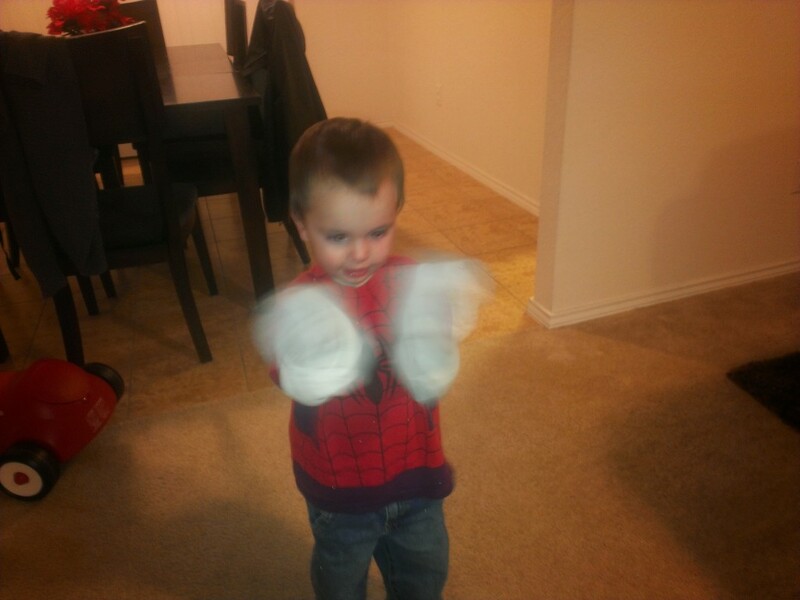 He was really excited about them. 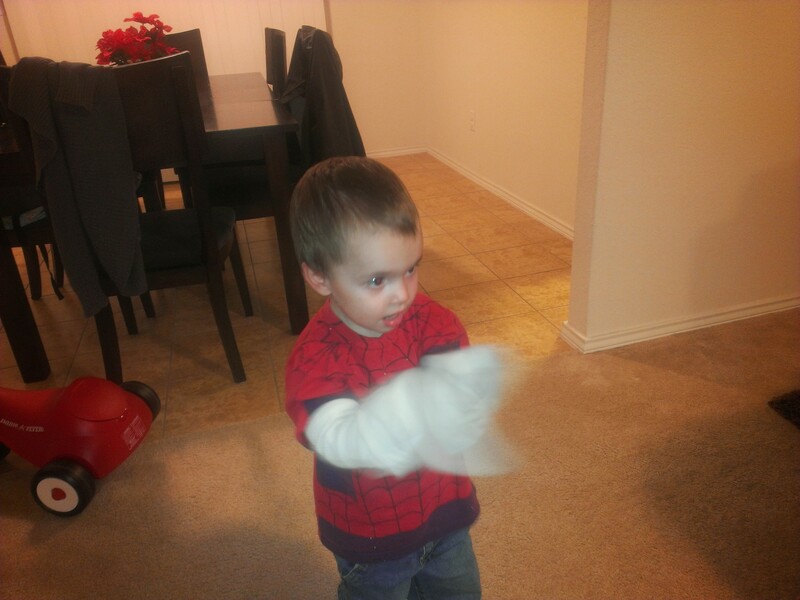 I looked around the house and then decided I had the supplies (a diaper box, construction paper, glue, markers, ribbon for straps, and a TP tube) to make him one, too. When I got it done and put it on him, he got super excited and ran around the room saying, “Beep beep!” He’s kind of lost interest in it, but that doesn’t really bother me since it was all free. 🙂 2) One day, Joseph was mumbling to himself and all I caught was “Texas”. So I said, “What about Texas?” and he answered with, “I like it!” I love that kid! 3) At lunch today, I was telling Joseph that he needed to eat another bite of food. He said, “Kay!” This is funny because a lot of the time I will leave the “O” off of “okay” and just say “kay”. He really is a little parrot! 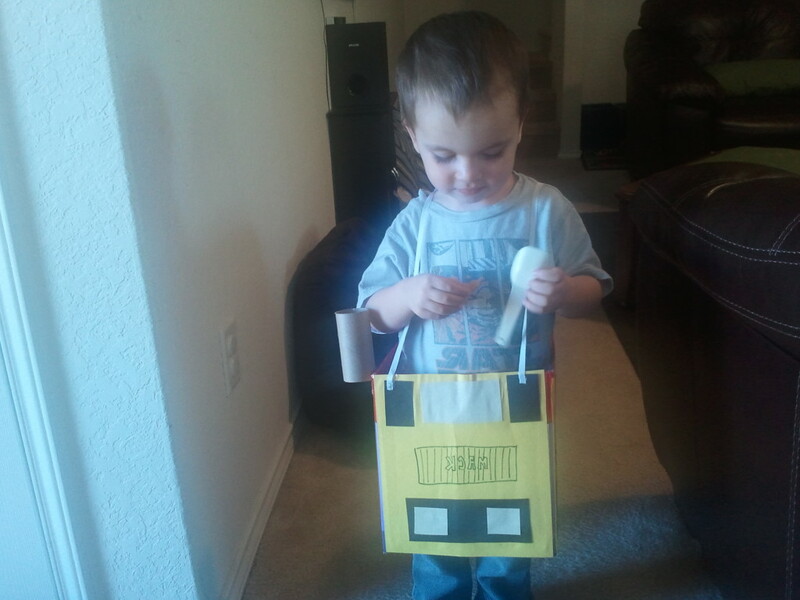 Here he is with his box “car”. We had some gorgeous weather this week. 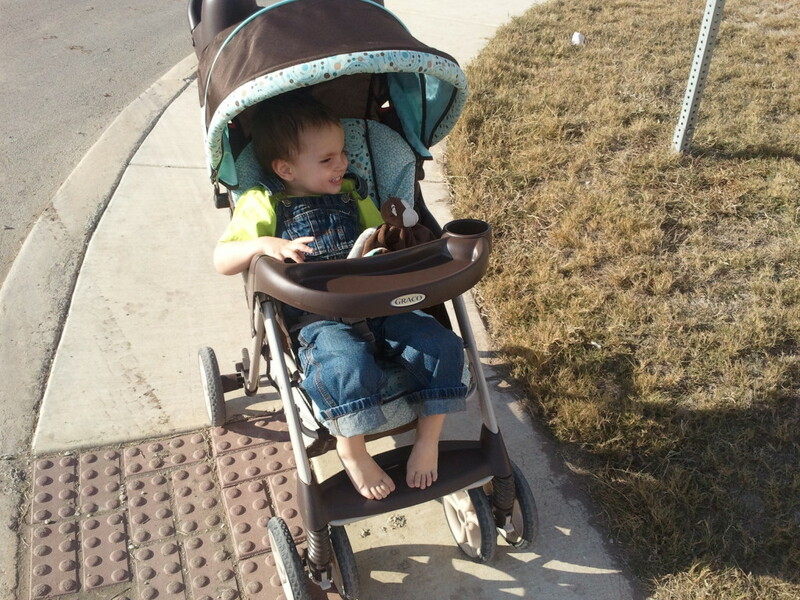 I took him for a walk and realized that not only did he not need a jacket, but he didn’t really need shoes, either. This was day one of our milk experiment (so still mostly soy milk). Wearing Daddy’s socks on his hands…I have no idea why he likes to do this, hahaha!